Recently I mentioned in a video on YouTube (it was either this one or this one) that my favourite style of pen to write with has to have a fairly thick barrel. I also had a bit of an epiphany because I realised that the reason for this is because of the way I hold my pen - balanced on my ring finger rather than my middle finger, therefore the thick barrel compensates for the difference in grip. So when choosing a pen to review from US-based pen retailer, Pen Chalet, it was only natural that I gravitate towards a larger sized barrel. I also chose to review a rollerball rather than a fountain pen simply because I don't use my current fountain pens enough and wanted a good quality, everyday pen. A couple of reservations I had when accepting this review was that it was being transported from the USA to the UK so delivery time was something I was conscious of and whether custom duty charges would be applied. As it was, I didn't need to be worried about either. The pen was shipped on the 14th June and I received it on the 22nd June (I've had slower deliveries within the UK) and no customs duty charges were incurred. Also, as you can see from the video and the image I shared on Instagram, it comes beautifully boxed in a leather-look case so would make a wonderfully presented gift for someone. The Monteverde Prima is a chunky, weighty pen and is really distinctive looking. 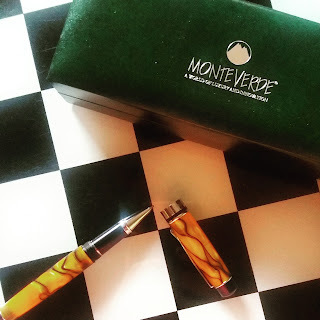 The barrel of the pen made from resin so the patterns on each pen are unique. Sticking with my orange theme for 2016 I chose the Tiger Eye Swirl (orange and black) but the pen is also available in other colours. You can see an 'unboxing' and a pen test in the video below. The pen has been in and out of my handbag for the past few weeks and has been used every single day. There isn't any noticeable damage to the barrel, the finials or the chrome embellishments which is great news. Yes, this may seem to be an expensive pen (the RRP is $65 USD) to be using on a regular but it's such good quality that it deserves to be used every day.